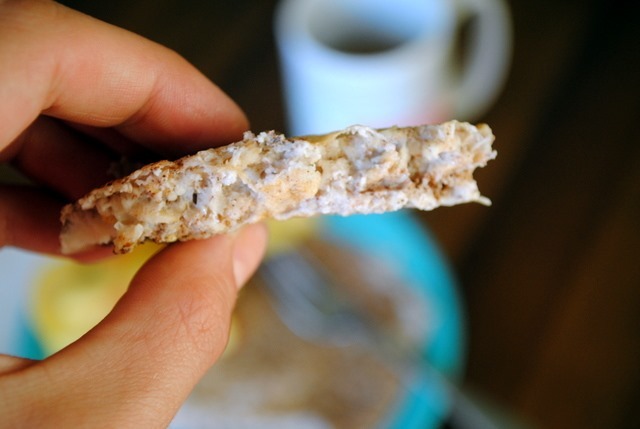 While I absolutely love protein pancakes, the preparation process surrounding protein pancakes can sometimes deter me from making them in the morning. They’re definitely not hard to make, but sometimes that extra step of using an immersion blender and cleaning it is enough to make me shy away from cooking up a batch of the filling pancakes. If you feel the same way, I think you might want to give today’s breakfast recipe a try! This recipe comes to you from my friend Caitlin who first told me about this recipe and promised me it tasted like a protein pancake. 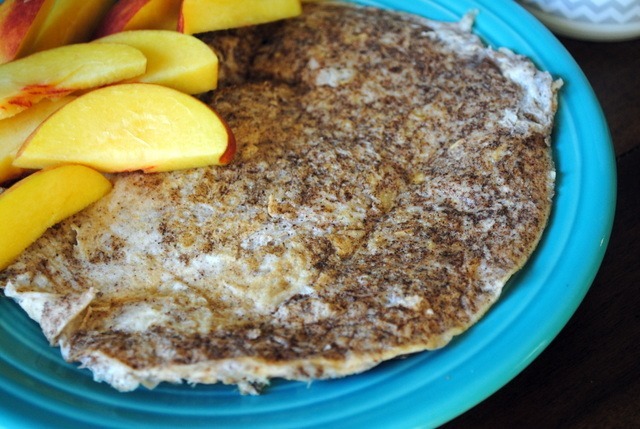 I was skeptical at first since the recipe is pretty basic and seems almost more like a sweet omelet than a protein pancake, but after one attempt, I was sold. It sounds really funky, but if you like protein pancakes or if you’re looking for a protein pancake recipe that doesn’t incorporate dairy or protein powder, I encourage you to give it a go! I’ve tried it with family and friends and it gets rave reviews from everyone. Sometimes my pancake comes out looking more like scrambled eggs than a pancake, so don’t worry if that happens to you, too! The taste is still the same. I like to eat my protein pancake after my morning workout (try this cardio arms workout — it’s a good one!). Do you like protein pancakes? What is your favorite way to make them? I make my protein pancakes with protein powder, egg whites, water, added oatmeal usually 1/4 cup or at least 2 tbsp, cinnamon and stevia all the time. I think it just depends on the ratio of your ingredients on how it will turn out. As long as it tastes good then its a winner right! Plantain powder is a great natural booster too!! 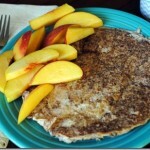 That uber similar to the oatmeal pancake recipe on my blog! I use this recipe everyday for my 2nd meal, but I make it into a waffle. My waffles are fluffier than my pancakes. I mix 1/3 c old fashioned oats and 5 egg whites with cinnamon and let it sit in the frig for about 30 mins. Stir and pour into the waffle maker and voila! Yes! Me too 🙂 I prefer the waffle version and actually do 6 egg whites and 1/3 cup oats and let it sit for a few minutes (while I get my coffee). 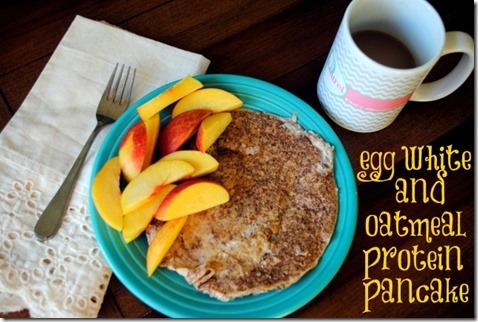 I eat this every morning for health and lactation purposes (those oats!) and I love love love it. I’ll add either bananas, coconut flakes, peanut butter, or just classic butter and syrup on top. So good. I always get super excited for oatmeal pancakes since they are by far my favorite type of pancake to make. I should start making them more but usually end up making them only on the weekends. Well, usually I find pancakes with egg whites or eggs can turn out a little eggy which and since I can’t eat eggs anymore I love making them with chia eggs. So good and filling. This definitely piqued my interest! I don’t often make protein pancakes, just regular ol’ carboy ones 😉 But these look good! 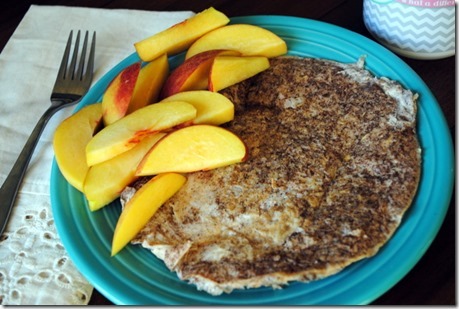 Any kind of protein pancake that doesn’t require dairy or use a darn banana is always welcome. I’m a little tired of bananas in my pancakes…just sayin’ ;). I have been enjoying combos of egg whites/sweet potato-butternut-or pumpkin puree/ plus almond meal, cinnamon, vanilla, and pinch of salt. Sometimes I add oatbran instead of the almond meal if I need a little extra staying power or carbs. Thanks for the recipe! My pancake recipe is 1/2 cup oats, 1/2 cup cottage cheese, 4 egg whites or 2 whole eggs, a pour of vanilla, and 1/2 teaspoon baking powder. I’ll admit to adding chocolate chips sometimes, as well. I don’t ever make regular pancakes anymore! ^oh, and everything should be blended in the blender. I’ll be real honest, I did not think that this could be tasty, but I really needed new protein idea’s for breakfast so I tried it. To my surprise I really enjoyed it and great protein. I was totally in the mood for pancakes, and I think I will make these! Thank you for sharing! my new favorite bfast is a banana pancake: blend 1 banana and 2 eggs in blender, then add 1 tbl applesauce and 1/2 cup oat bran, blend for five seconds and then heat on skillet. taste so yummy – let me know if you give it a try! Love protein pancakes. Will have to try this recipe for breakfast this week! Yummmm I will definitely have to try these!!! It’s too hard to cook strenuous recipes in the morning so this looks great! My favorite chocolate protein pancake recipe is a twist on the two-ingredient pancake recipe that has been floating around the blogging world for about six months. My version just so happens to be gluten-, and grain-free too! This pancake looks very… interesting. I think I shall try it tomorrow morning for breakfast. You seem to eat them quite often, so I might have to try this recipe. What kind of oats do you use and do you blend them? Also, I really dislike throwing away yolks, and would prefer to just use regular eggs or fewer egg-white. Do you have any recommendations on how I could do that? Would you maybe use 1 egg and 2 egg whites or something like that? I’m grateful for any advice you can offer, so thanks in advance! You can buy just 100% all egg whites in a carton. I use it everyday to make omelets too. Try adding raisins and /or bannas . Banana pancakes are awesome. Great for before during or after your workout or a snack anytime !